I’ve been doing a little bit of online shopping (my specialty since, well, who wants to hit Toys ‘R Us with six kidlets in tow?) and I’ve found two books that I think are worth mentioning. The first book is just lovely to behold. Other than that, “Motherbridge of Love” is a book based on a sweet poem, by an unknown author, beautifully illustrated. It is about a birthmother and an adoptive mother, and the love they both share for the same child. The other is a book by Todd Parr, author of the wonderful “The Okay Book”. “The Family Book” is about families of all types, adoptive, blended by marriage, one parent. I am hoping that by having books like these around for my children to read (all of them, not just our adopted children), it will open the door for future conversations about adoption, our family, and how it all makes them feel. The Family Book is, hands-down, Kate’s perennial favorite. She’s in a Winnie-the-Pooh phase right now, but when that passes, she’ll be back to Todd Parr again. His books are just so. much. fun! Thanks for the tip on shoppint with them through LWB- I didn’t know this, and I use Amazon A LOT. I will have to look into both books- the first I’d heard of but I am reluctant to spend money on things for Macey when she is such a long way away! Great ideas, thank you Stefanie! Love the meal plan Monday too. Wish I would do it for once. Also love your Thanksgiving pics! Beautiful Beautiful Beautiful family. Thanks for the tips on the books and the Amazon/LWB connection. I really appreciate all the great things you share with us! Thanks for the reminder about the LBW-Amazon link…..I knew that and forgot! 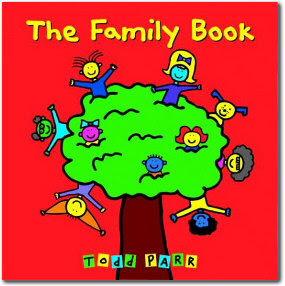 We love Todd Parr books too! Thanks for the LWB-Amazon post. I never knew this and I buy from Amazon ALOT, especially this time of year!